Adverse weather conditions in the monsoon season continues to wreak havoc in the far-flung areas of Kinnaur and Spiti valley in Himachal Pradesh creating panic among the tribal people. Most of the areas of Kinnaur and almost the whole of Spiti valley was still cut off by road for the past many days. 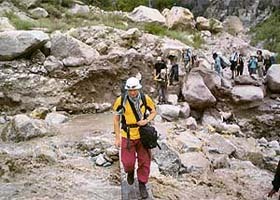 Foreign tourists cross the Raldang nullah near Ribba village of Kinnaur district on a wooden log as the concrete bridge situated on the Hindustan-Tibet road was washed away in flash floods early on Thursday morning. His failure to substantiate his claim has put India in a bad light. India has been publicly dishonoured. The government today came under sharp attack from the BJP-led Opposition, Left parties and it own allies for being lenient with PepsiCo and Coca Cola, the multinational companies found supplying soft drinks and water having pesticide contents. The Justice R S Pathak Inquiry Authority that went into the allegations against former External Affairs Minister K Natwar Singh and the Congress party that they were the beneficiaries in the UN oil-for-food programme bungling during sanctions on Iraq as referred by the Volcker Committee, today submitted his report to Prime Minister. Significant positive gestures were made by the Prime Ministers of India and Pakistan today which may not well be purely coincidental. Prime Minister Manmohan Singh today telephoned Ms Asma Jahangir, arguably one of the best known names among Pakistani women in contemporary period, and apologised to her for the “ill treatment” meted out to her by the Delhi Police. The Delhi Police today filed the chargesheet against Rahul Mahajan, son of late BJP leader Pramod Mahajan, and five others in the drug overdose case. Additional Sessions Judge S.N. Gupta issued notices to all accused to be present in the next hearing on August 5. Senior BJP leader and former External Affairs Minister Jaswant Singh’s troubles appear to know no end as there are reports of a move to remove him from the post of the Leader of the Opposition in the Rajya Sabha. President A.P.J. Abdul Kalam, who has been sent the Office of Profit Bill afresh after reconsideration by the Lok Sabha and the Rajya Sabha without effecting any changes, is studying the legislation. The plunder of the ecologically fragile Shivalik foothills in Punjab continues unabated. 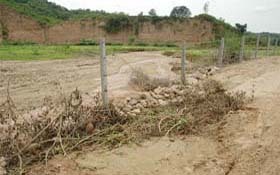 Unscrupulous residents are altering the course of rivulets to suit their own ends while land-hungry persons are either buying the rights to these stream beds from poor villagers or illegally occupying the same. Diversions like these are coming up on a large scale in rivulets in Mohali district.